The Talon flew as a mission support aircraft at Langley from 1972 to 1980. 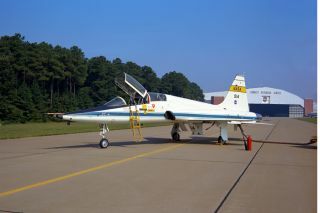 In this historical photo from the U.S. space agency, this Northrop T-38A flew at Langley from 1972 until 1980, when it was returned to the Johnson Space Center's flight operations at Ellington AFB, Texas. While at Langley, the Talon flew as a mission support aircraft and participated in aircraft noise studies. It was also used as an adversary against the XV-6A Kestrel "jump jet" in one-on-one combat to test Vectoring in Forward Flight (VIFF).